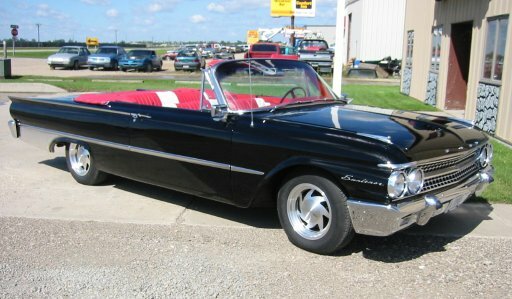 This car has had a frame off restoration and it is a absolutely breathtaking black 1961 Ford convertible with a perfect red and white interior. It has the correct 352 cubic inch motor and Cruise-A-Matic automatic transmission along with power steering and power brakes. The body is very straight and rust free with no dents or waves, the glass is all perfect, the chrome is perfect, the engine compartment is nice, the trunk is nice, the underside is nice, etc. I really can't explain this car properly except to tell you there will be no disappointments in the appearance or in the mechanical condition of this car.